When I was young, there was this fascinating thing called gum. 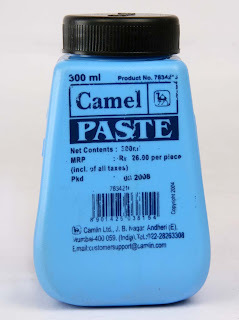 It was sold in a blue bottle and was used by all school-going children indiscriminately when they wanted to cover their school books and for their craft class. The image should tell you what gum means exactly. When it’s summer in Chennai, the humidity, which is at 56% today, coats itself on your body like the gloopy gum in the blue bottle. The trouble is that with 36˚C temperature, the humidity adds to this strange burning feeling. And, 36˚C actually feels like 46˚C. In the coming days, it’s only going to get hotter. This heat is something I’ve never really understood about this city. We’re coastal with an unbroken coastline, and yet, the weather here is this bizarre heatwave-ish thing that everyone is constantly bitching about. I don’t mind the sweaty, but, when my body feels like it’s been coated with a finely brushed-on layer of Camel gum, I don’t like it at all! To make things even more wonderful are the timed power cuts across the city, the mad voltage fluctuations and the fact that most electronic equipment cease to function in this weather. When you work in a glassed-in office like mine, a non-functioning air-conditioner only means one thing, torturous hell. I just need a ceiling fan to get by. One working, fast-moving ceiling fan. Baby, I can yabil to imagine yourvar pains. Seriously, this power cut thingy is exposing a lot of posh localities to be very worshtu places wonly! Hah I miss the Chennai heat for all its worshtu-ness!